Ok this salad. It’s crunchy and soft and sour and sweet and cold and everything you want when you’re sweating buckets in the middle of a hot and humid Summer. And it’s so easy, it seems almost pointless to give you an actual recipe. This salad shows itself in different forms all throughout Japan, but I grew up on a version that relies on three basic ingredients: cucumber, wakame (a type of sea vegetable), and shaved onion. It’s key to soak the onion in cold water and drain thoroughly before adding it to the salad so that it doesn’t overpower the other more delicate flavors. When you soak raw onions, it significantly mellows that really strong onion bite while maintaining and even enhancing that awesome watery crunch. My favorite salad trick. And shaving it as thin as possible is also really important. The best way to achieve that perfect, paper-thin slice is to use a mandoline slicer. My favorites are the Benriner and the Kyocera slicers. I own both and they both work beautifully. The real star of the show, though, is the cucumber. At peak season, when my cucumber plants are overflowing with fruit, I make this salad at least weekly. And my family devours it. I’m lucky to have heirloom Japanese cucumbers growing in my garden, and as you can imagine, they are ideal for this dish. They’re juicy with a very subtle tangy sweetness, have unnoticeable skins and seeds, and are very long and thin. If you can find them, definitely use them. But I know not all of you have access to them, so those baby cucumbers are the grocery store are great, or Armenian, English, really any thin-skinned cucumber will do. Traditional American cucumbers, though they have their rightful place in other applications, unfortunately aren’t great candidates for this particular salad. 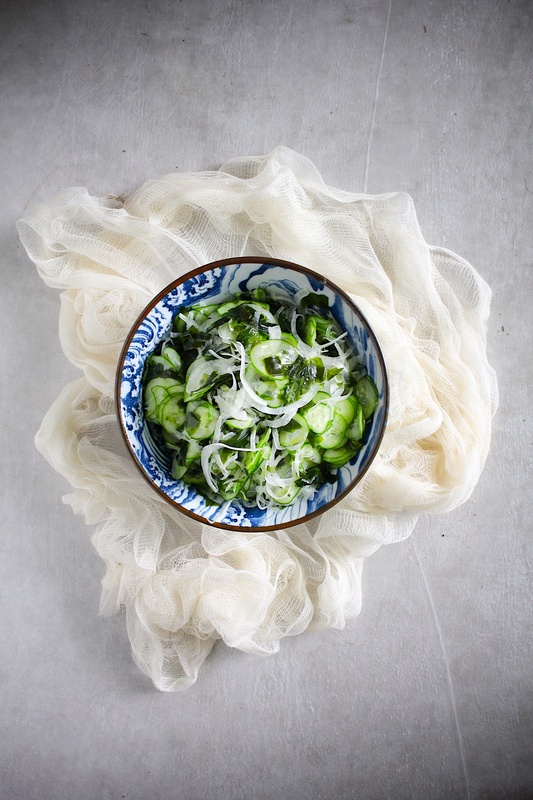 Once the onion is shaved and soaked for 15~30 minutes, the wakame is rehydrated (which only takes a couple of minutes) and squeezed of excess liquid, and the cucumber is sliced paper thin (also on the mandoline), all you have to do is dress and toss. And the dressing couldn’t be simpler: vinegar, pure maple syrup, and salt. Toss and serve. If you’re a little squeamish about trying seaweed, this is a great introduction. The ocean-ey, briny flavor and slippery texture aren’t as noticeable, especially because you squeeze out excess liquid, which prevents any sliminess that can often be associated with wakame. When buying wakame, look for the packages where the wakame is already cut into small pieces. If that’s not available, go ahead and cut them into smaller pieces with kitchen shears before soaking them in water. Slice the onion as thin as you can while still maintaining it's shape on a madoline slicer and place in a fine mesh strainer over a similar-sized bowl. Fill the bowl with cold water and let the onions soak for 15~30 minutes, replacing the water 2~3 times. Drain well. Meanwhile place the wakame in a small bowl and cover with lukewarm water. Once full hydrated, drain and squeeze out as much water as you can. 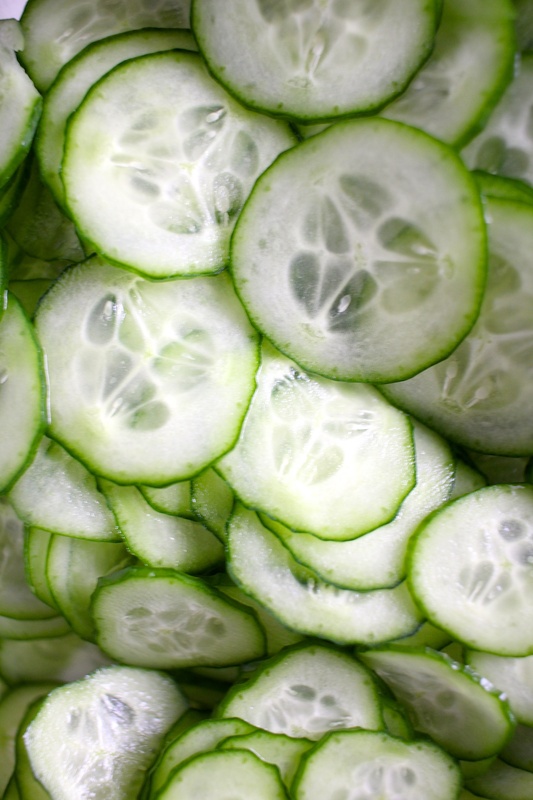 Slice the cucumber very thinly with a mandoline slicer and add to a medium bowl. Add the prepared onions and wakame. In a small jar combine the vinegar, maple syrup, and salt and stir until the salt has mostly dissolved. Pour over the vegetables and toss to combine. Serve immediately.